In most all military boot camps, one of the first things a new recruit is taught is close order drill…or for the non-military type…marching. 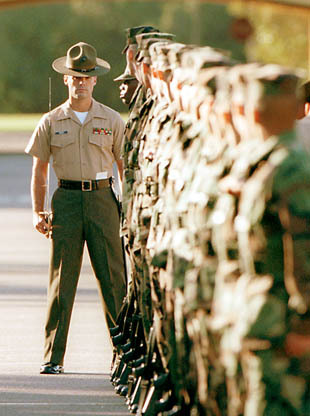 The drill instructors use drill to teach discipline by instilling habits of precision and instant obedience to orders, to build unit cohesion, and to provide simple formations from which combat formations may be readily assumed. First the first few weeks the recruits spend hours upon hours learning drill through continuous repetition. Some movements are quickly grasped while others are quite painful. I remember clearly the two most difficult drill movements for me and my unit to learn: “About Face” and “To the Rear”. “About Face” is a standing individual movement while “To the Rear” is a marching movement used by the entire unit. Both drill movements serve the simple purpose of turning the individual or the unit 180 degrees in the other direction. History provides us with great examples of men and women who have chosen to change the course of their life for the better. I was sharing with my children recently the story of a man, living centuries before, who changed the negative direction his life was taking. His name was Paul, formerly known as Saul of Tarsus. Known as a relentless persecutor of the early church, he was determined to stop the spread of Christianity. But after a dramatic conversion on the road to Damascus, Paul devoted the rest of his life to preaching the gospel and building the church. Today we remember him as a missionary, church planter, and author of thirteen New Testament epistles. For my boot camp platoon, Platoon 1003, once we individually and collectively learned the difficult tasks of changing our direction we were able to move on to advanced training, graduate as Marines, and fulfill our purpose in serving others. And as Paul clearly shows us, it doesn’t matter how far off course you’ve gotten; it isn’t too late to change your direction. This entry was posted in Leadership, Marine Corps, Misc.